Vegetables in many shades of purple. I love all things vegetable. Raw, cooked, green, yellow, leaf, stalk or root. And, I’m a sucker for novelty. 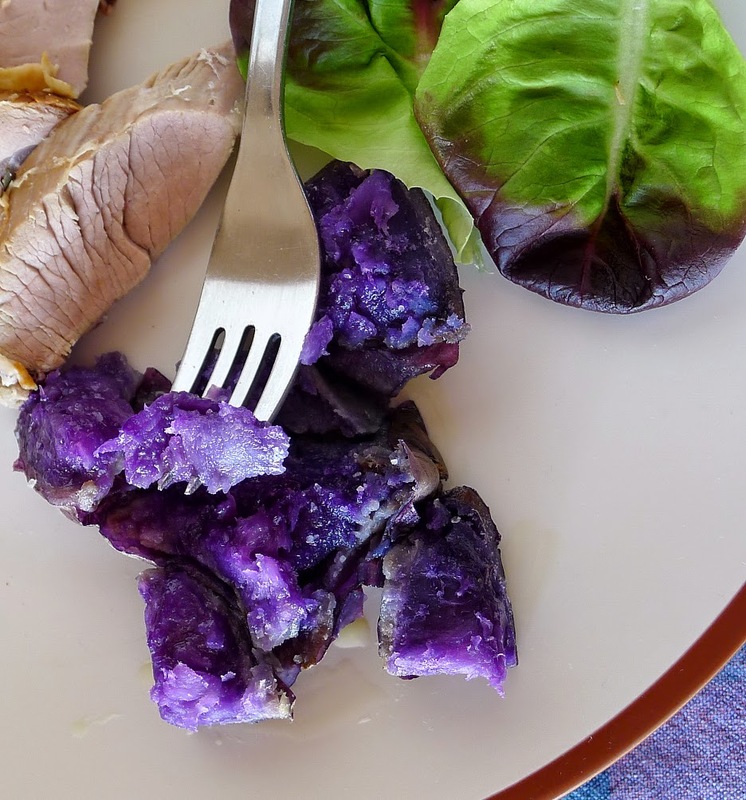 So, when I saw those lumpy looking purple potatoes, how could I not try them? I bought a pound-sackful of the potatoes, then went back to get more in order to try them in several ways. 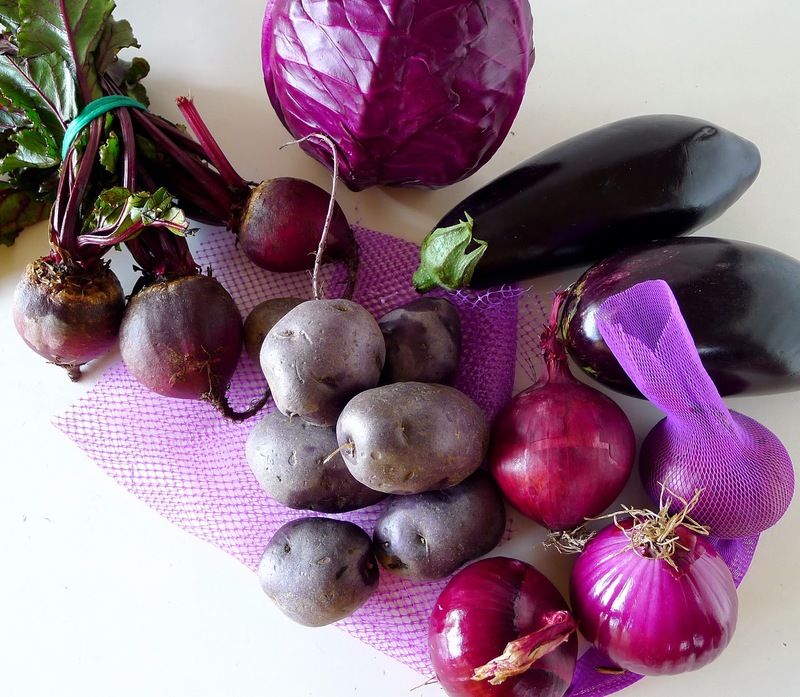 I also collected some other purple vegetables, just for the visual fun of a still-life in purple. 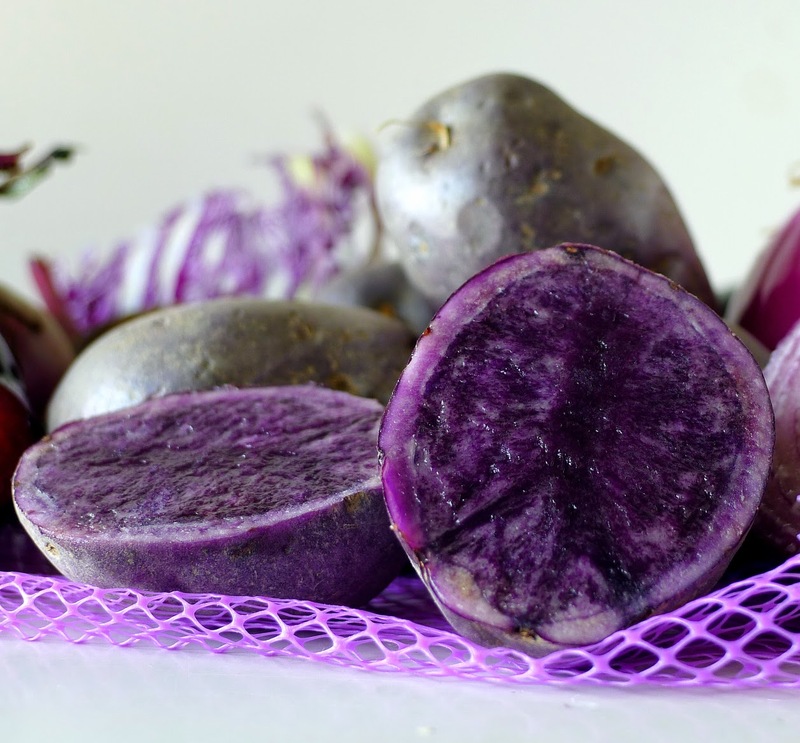 Purple potatoes, like other blue and purple fruits and vegetables, are a rich source of anthocyanins, valuable antioxidants that help regulate blood pressure, boost the immune system and contribute an anti-inflammatory effect to the body. The skins of the potatoes are deep brownish-purple, but cut one open and it reveals a deep purple on the inside. Purple potatoes pale a little with boiling (anthocyanins are water soluble), but they don’t bleed like beets. Baking in their skins is one way to preserve the vibrant violet color. Even better is microwaving. 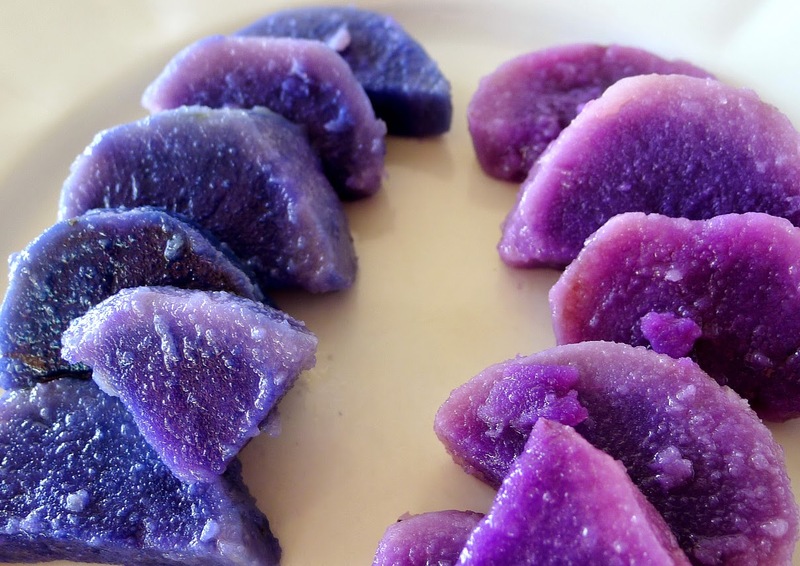 How do purple potatoes taste? Like potatoes. Like the very best potatoes, wonderfully earthy, a little sweet. They smell more potatoey too, as if they had been freshly dug from the earth. The texture is like a good russet or other baking potato. The ones I bought were all medium-small, golf ball-size. Acid (lemon juice or vinegar) will turn the potatoes toward the red-violet hue; alkaline (such as baking soda) makes them bluer. Shown in the photo, cooked purple potatoes on the left; on the right, cooked potatoes marinated in lemon juice. I cooked the purple potatoes in various ways. While they make perfectly good fries, once they’re nicely browned, the color hardly matters. A potato gratin with cheese was luscious but, again, the color hardly mattered. Quartered potatoes tossed with olive oil and roasted were perfect and pretty alongside roast lamb. Baked in their skins and served with pungent alioli (garlic mayonnaise), they were sublime. And, a new take on a favorite tapa bar salad—papas aliñadas, with a lemony dressing were a great success. Remembering the color wheel, I used yellow as a complement to the purple, substituting yellow tomatoes and strips of yellow bell pepper for the red in the classic potato salad (that recipe is here ). 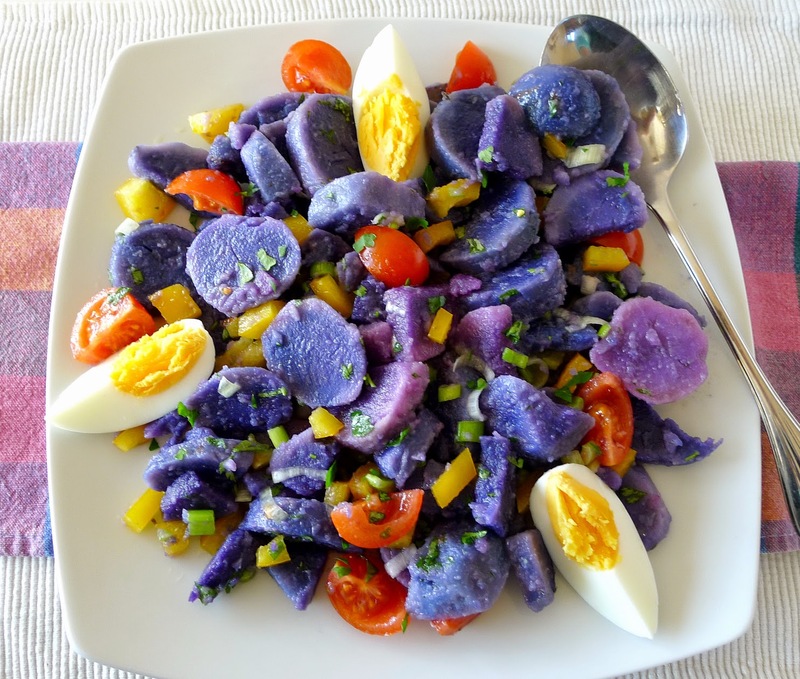 Purple potato salad with lemon dressing. Don’t add the lemon dressing to the potatoes until immediately before serving as the acidic lemon juice tends to turn the potatoes to a pink hue. Unless, that is, you prefer a pink potato salad! 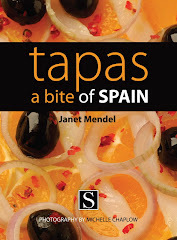 Serves 10-12 as a tapa or 6 as a side dish. Place the potatoes in their skins in a pan and cover with water. Add 1 teaspoon salt and ½ teaspoon vinegar. Bring to a boil and cook until potatoes are just tender, about 18 minutes. Drain. When potatoes are cool enough to handle, peel them and slice the potatoes into a bowl. Add 1 teaspoon salt and 2 tablespoons of olive oil. Let the potatoes marinate at least 1 hour or, covered and refrigerated, up to 24 hours. Shortly before serving, add the scallions, cherry tomatoes and diced bell pepper to the potatoes. Combine 4 tablespoons of oil with the lemon juice. Mix into the potatoes. Spread the potatoes on a platter. Garnish the top with parsley, sliced egg, chunks of tuna, if using. Put a few lettuce leaves on the sides. 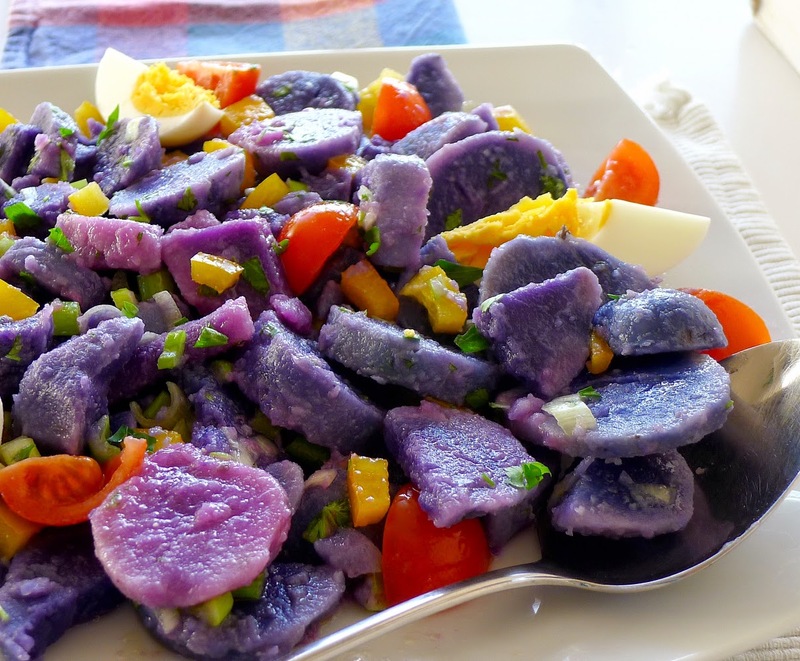 Like the classic tapa bar salad, but with purple potatoes. 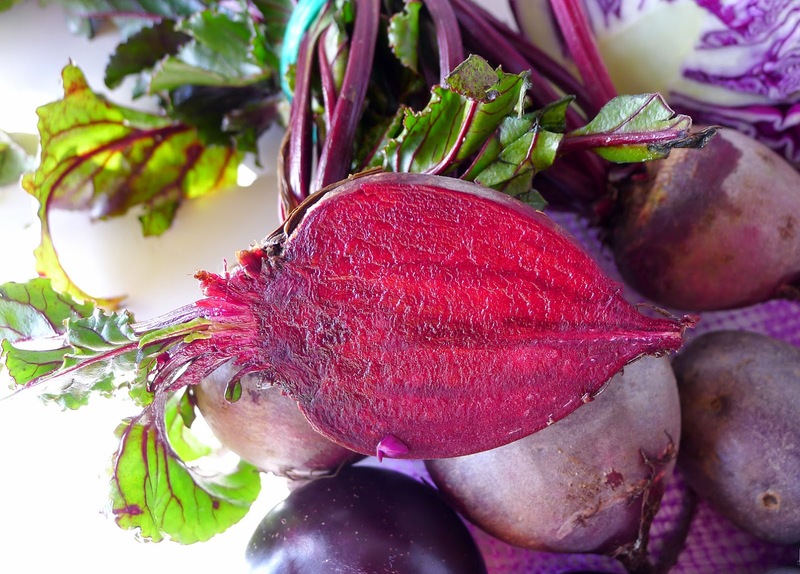 Beets are bleeding hearts—the magenta-hued juice (betacyanins) colors everything. At first I tried to avoid this by layering the beets and grapefruit segments. 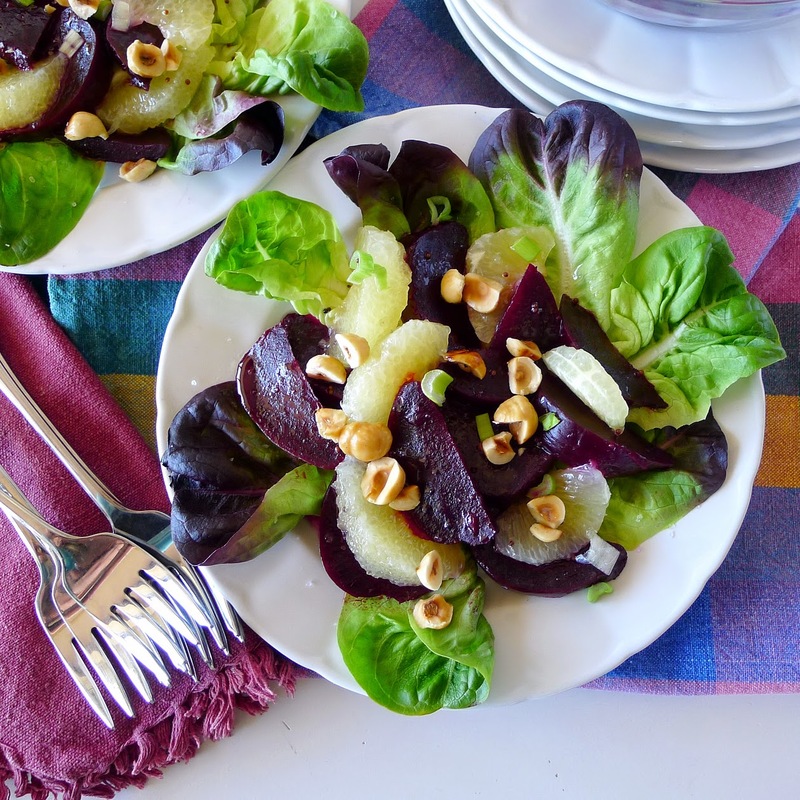 Then I tried combining everything with the dressing and produced a much more vibrant salad, as the beets tinted the grapefruit. Trim the stem and roots from the beets. Wrap them individually in aluminum foil. 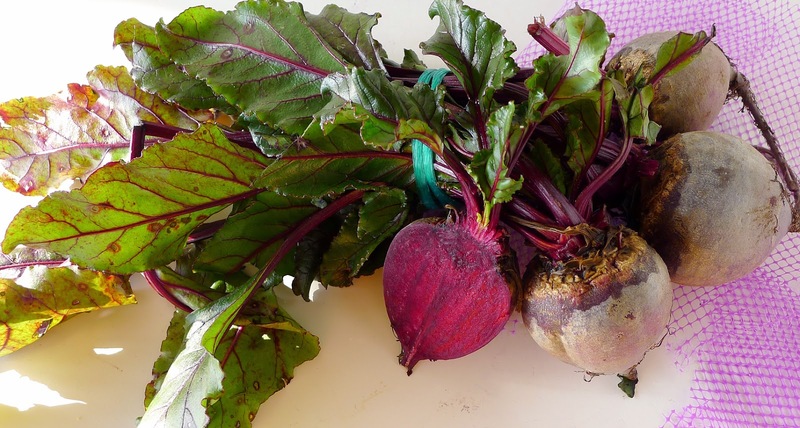 Place them in an oven pan and bake 1 hour, or until the beets can be easily pierced with a skewer. (Beets never get soft, but stay crisp-tender.) Remove from oven and allow to cool. Pinch off the skins and cut off stem tops. Cut the beets in half, then into thin wedges and place in a bowl. Sprinkle with coarse salt and 1 tablespoon oil. Peel pith and skin of grapefruit. To peel the grapefruit, cut a slice off top and bottom. Place on cutting board and slice down around the curve of the fruit to remove peel and white pith. 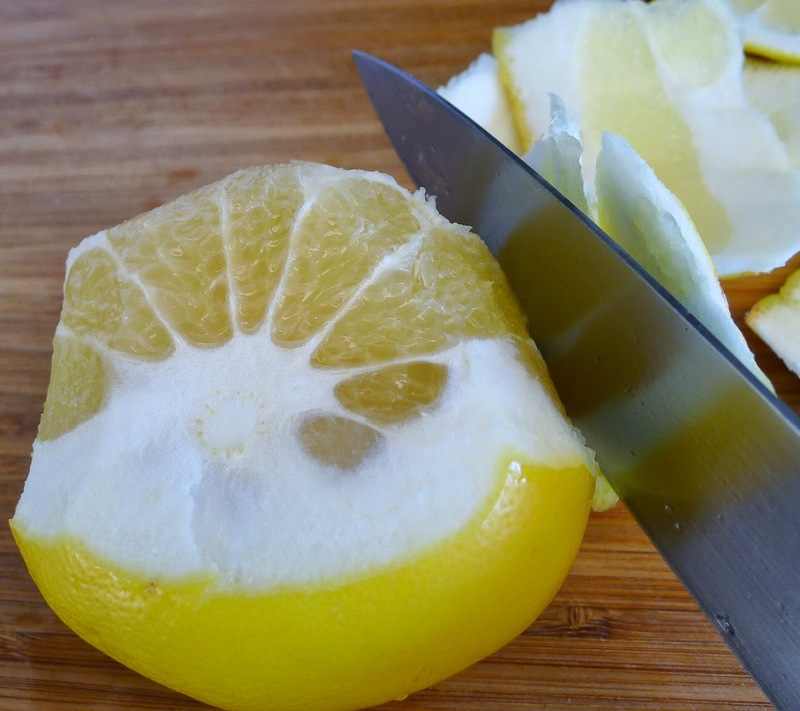 With a small knife, cut between the membranes, releasing the grapefruit segments. Squeeze the juice into a small bowl. Toast the hazelnuts in a small skillet. Chop them coarsely. For the vinaigrette: toast the mustard seeds in a small skillet until they begin to pop. Remove them to a small bowl. Add grapefruit juice, vinegar and honey. Whisk in the olive oil. Season with salt. Place a layer of greens on salad plates. 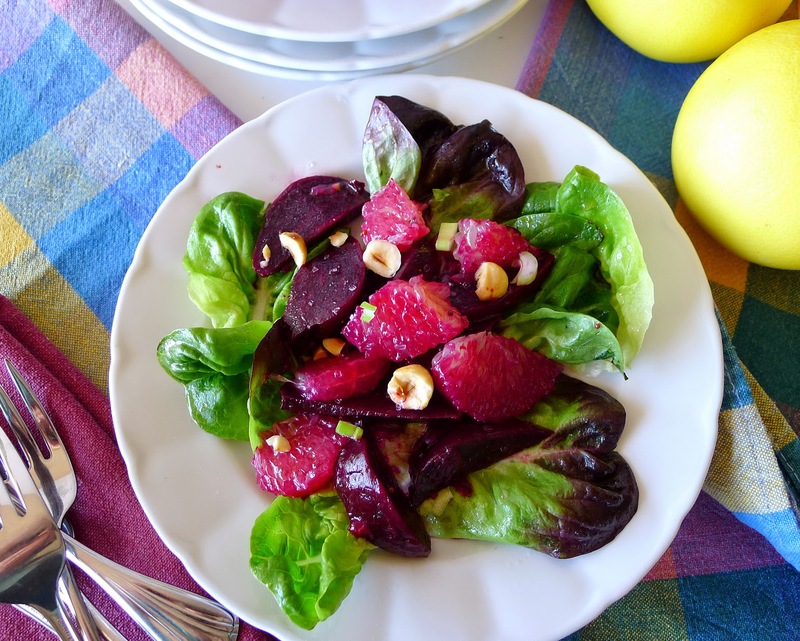 Combine the beets and grapefruit segments. Stir in the vinaigrette. Divide the beets between the plates. Top with coarsely chopped hazelnuts and sprinkle with chopped scallions. I usually eat fish on Fridays, not for any religious reasons, but because it’s the day of the week with the biggest selection of seafood at the market. Now, with the beginning of Lent, the period leading up to Easter when many Catholics observe days of vigilia, or abstinence from eating meat, the fish markets are really sensational. Colorful wrasse, something different at the fish market. This one has been gutted and scales removed. The season brings a bigger variety of fish than usual, including some fish that I don’t find the rest of the year. So, it seems like the right time to sample seafood that I don’t usually cook. 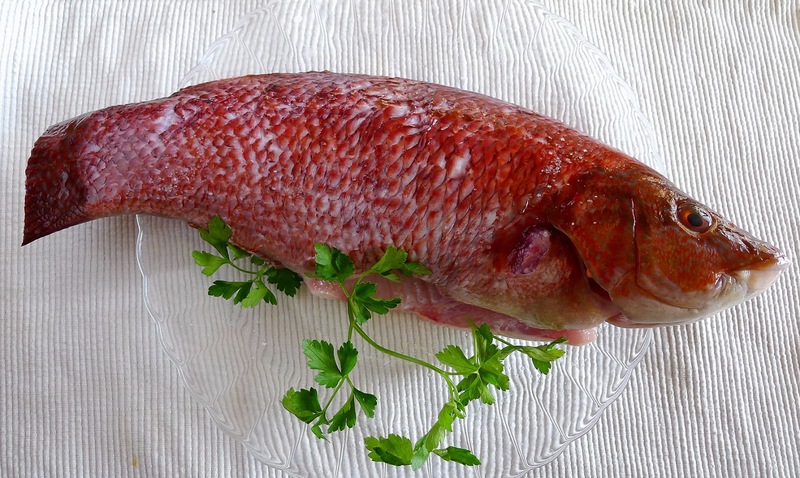 While wrasse is not precisely a “trash” fish, neither is it commonly marketed. Because it’s not an A-list fish such as bass, sole, hake, its price is lower. I found the wrasse to be “really good,” though not quite “excellent.” The flesh is white, lean and bland in taste; the texture is firm-flaky, like other rock fish; bones not unlike those of sea bass, which is to say, quite acceptable. Small wrasse are best in soups and seafood stews. 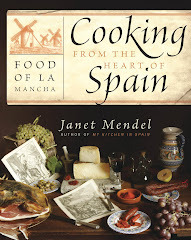 (A good soup to try is cachorreñas, made with sour Sevilla oranges, recipe ) But my catch was definitely large enough to consider other ways of cooking. 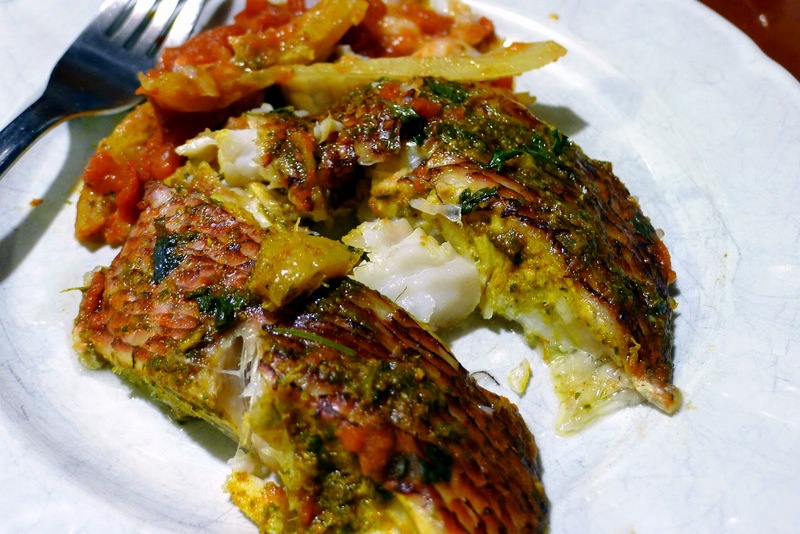 Fish is baked with a spicy chermoula sauce and strips of preserved lemon. I picked a Canary Islands recipe for baked fish, planning to serve it with spicy mojo verde sauce, made with green chile and cilantro (recipe here ). 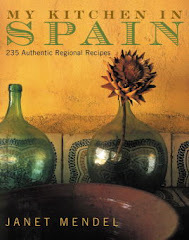 Then I happened upon a similar recipe for Moroccan fish tagine in Paula Wolfert’s Moroccan Cuisine (originally published as Cous Cous and Other Good Food from Morocco in 1973). 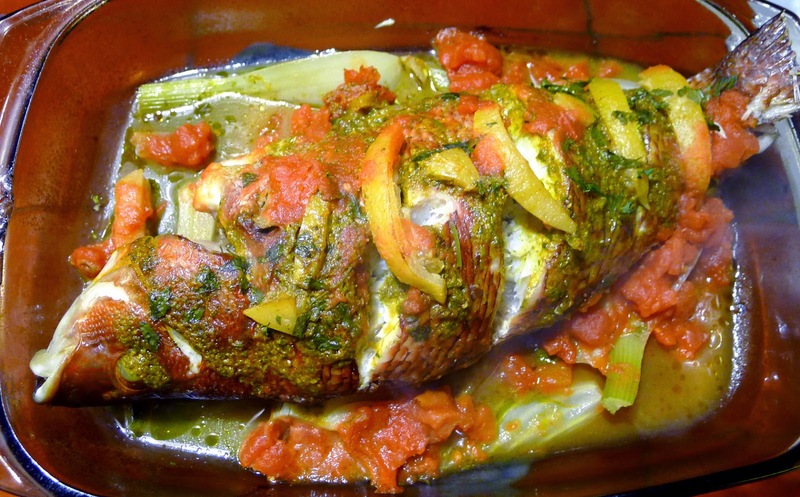 The fish is baked in the oven with chermoula sauce/marinade and preserved lemons. Chermoula is almost identical to mojo (after all, the Canary Islands are closer to Morocco than to mainland Spain). Plus, I just happened to have some preserved lemons waiting for just such an occasion. Salty preserved lemons are a Moroccan condiment. You can buy them at specialty food shops. I get the lemons at a local market that has several Moroccan butchers and food shops catering to the large Moroccan population in southern Spain. 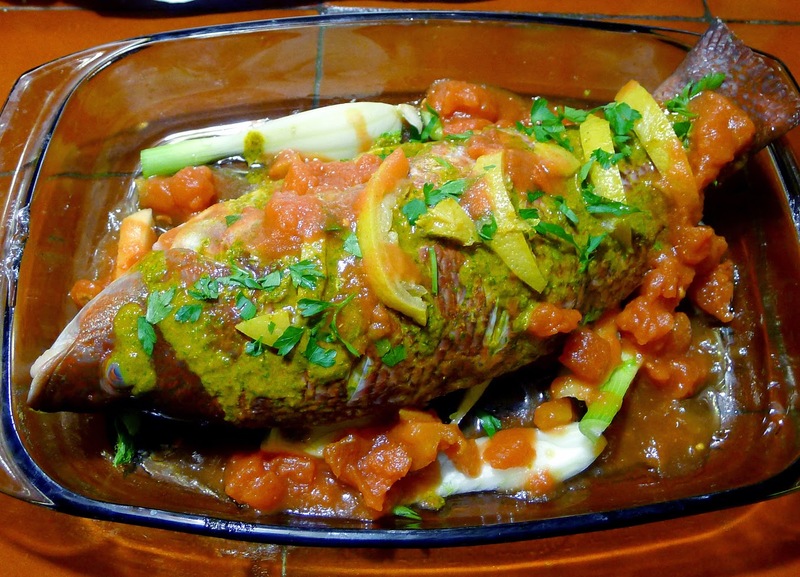 The sauce keeps the fish moist as it bakes and the lemons punch up the flavor a lot. Good way to go if a wrasse comes your way, but you could try it with sea bass or similar fish. I like cooking whole fish. Leaving the head on helps keep the fish moist. And, it’s easier to lift the flesh off of cooked fish than it is to fillet raw fish. Sprinkle the fish inside and out with salt. Cut 3 or 4 deep slashes in the fish, on both sides. To make the chermoula, combine in a blender the cilantro, parsley, garlic, cumin, pimentón, saffron, cayenne, olive oil, lemon juice and ½ teaspoon salt . Blend to make a smooth sauce. Spread the sauce on both sides of the fish and inside its cavity. Allow to stand at room temperature for 30 minutes. Cut the fennel in half, then cut it lengthwise into strips. Arrange them in the bottom of a baking dish large enough to hold the fish. Place the fish on top. 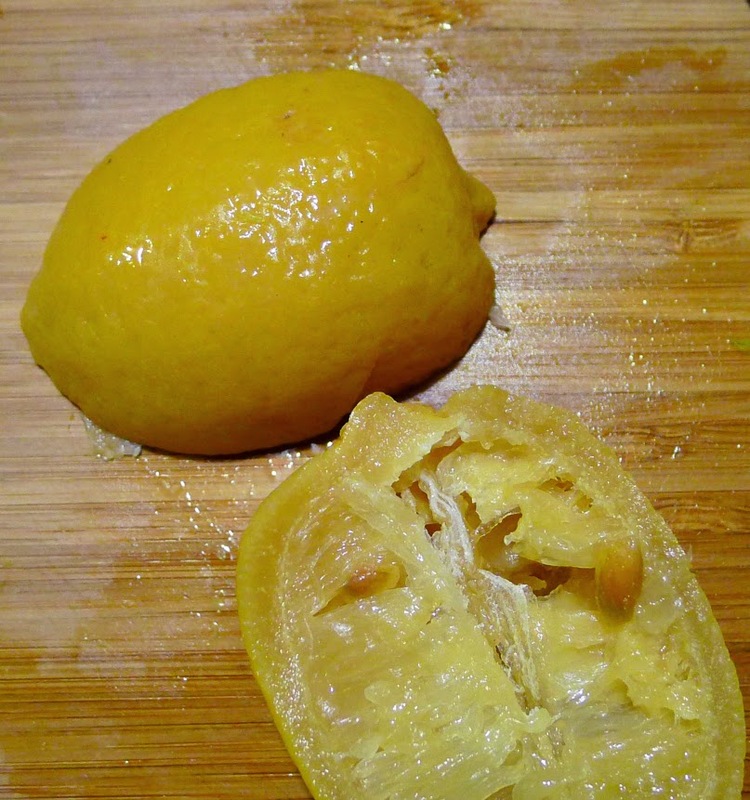 Cut the preserved lemon rind into strips, discarding the flesh. Insert strips in the slashes in the fish’s flesh. Scatter the remainder around the fish. Spoon over the tomatoes and 1 tablespoon chopped parsley. Cover the baking dish with foil and bake the fish until it flakes and easily pulls away from the bones, about 45 minutes. Sauce keeps fish moist while it bakes. Do you do Pancake Day? Pancakes happen on Shrove Tuesday (this year it’s February 17), otherwise known as Mardi Gras or, in Spain, Carnaval. Eating pancakes the day before the beginning of Lent is not only a custom in England, but also in Galicia (northwest Spain). 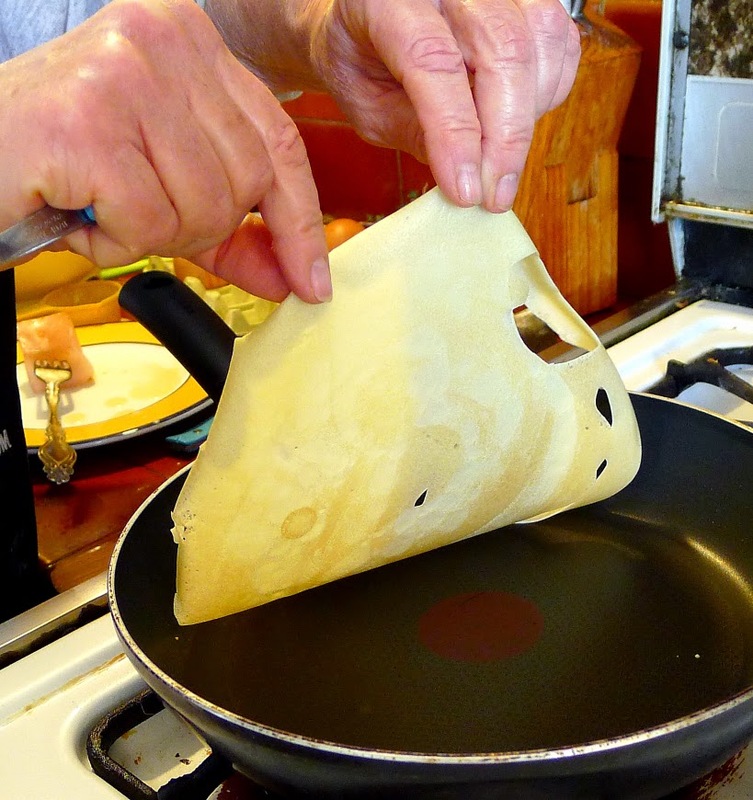 Filloas--crêpes from Galicia, typical for Carnaval. In Galicia they’re called filloas and they are rather more like crêpes than like hefty pancakes. 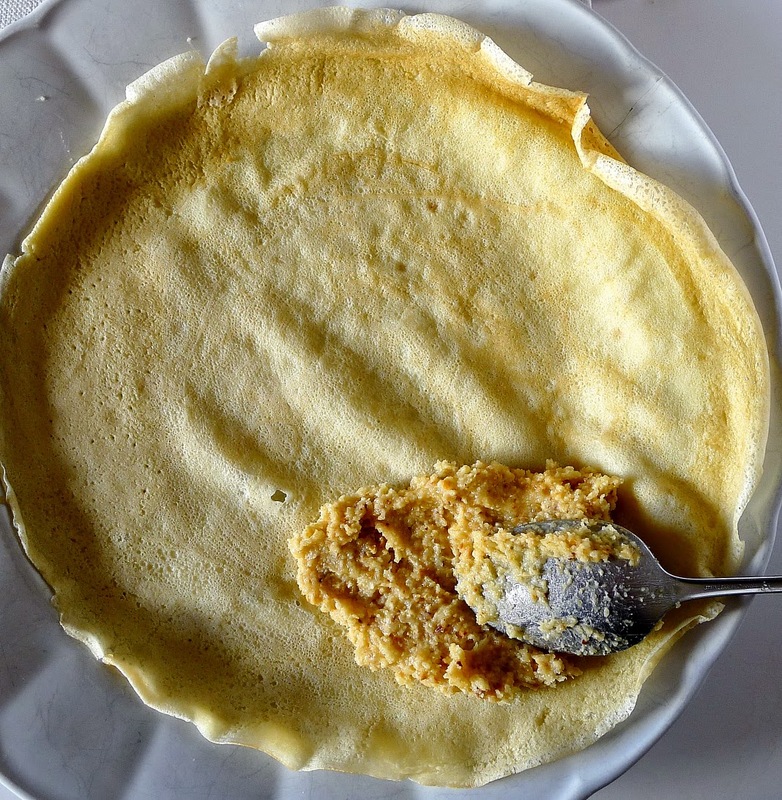 Perhaps due to a shared Celtic ancestry, crêpes are as popular in the northwestern Spanish regions of Galicia and Asturias as they are in Brittany. Filloa comes from the Latin folio, meaning "leaf". They are a favorite dessert during Carnaval—the festivities preceding the penitential Lenten season. Filloas are also made during the winter pig slaughtering. Then pig’s blood is incorporated in the batter and the crêpes are fried in lard. 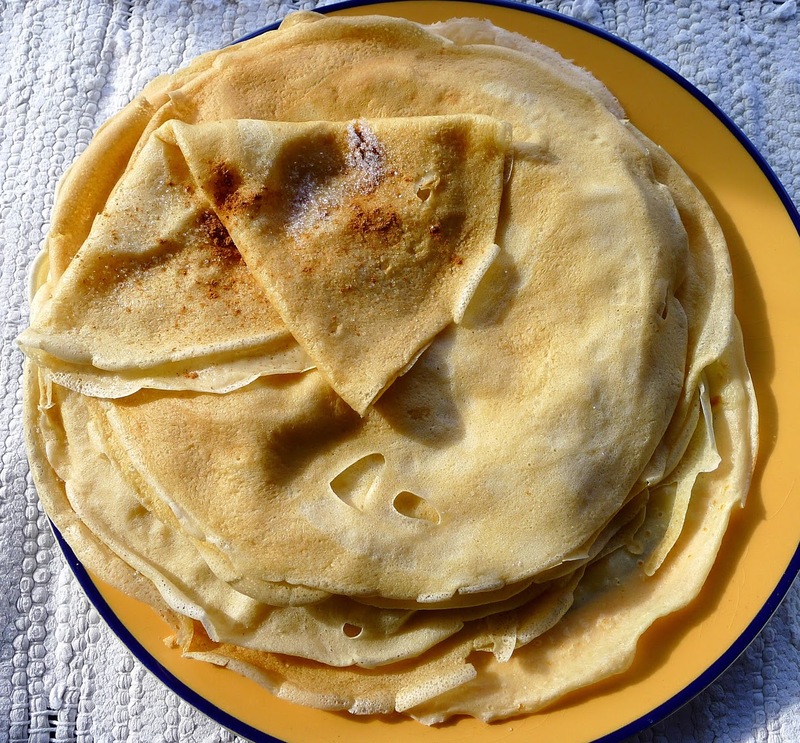 Variations of filloas are made with corn meal or rye flour instead of wheat flour. Filloas quemadas are crêpes flambés, usually with brandy, anise or herb liqueur made from orujo, the local grape brandy. 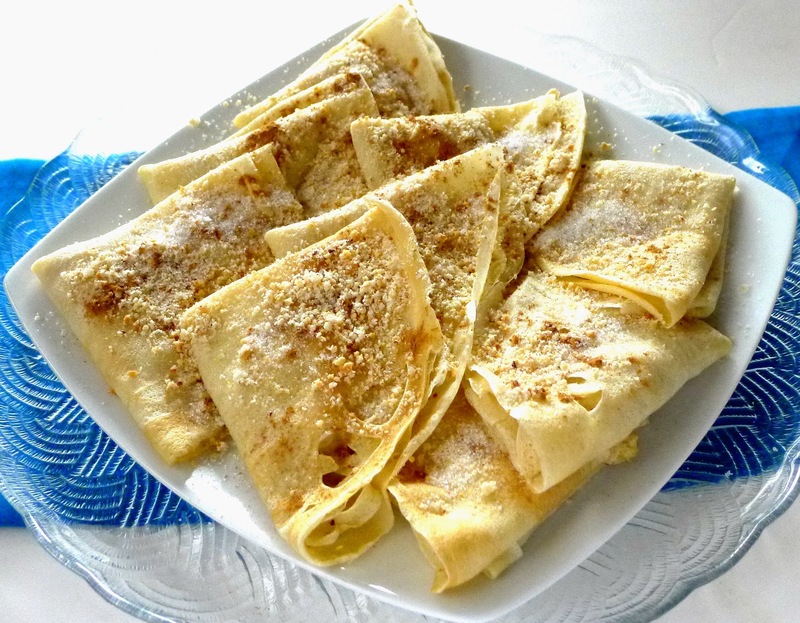 Filloas may be served folded into quarters and sprinkled with sugar and cinnamon or folded around a filling. Other sweet alternatives are custard cream or chestnut purée. The crépes are served too with savory fillings such as seafood or grelos (broccoli rabe, the signature green of Galicia). This basic recipe can be used for sweet or savory crêpes. The crêpes should be very thin, so add enough water to the batter so that it covers the bottom of the skillet. Combine the eggs, milk and aguardiente, if using, in a blender and blend to combine. Blend in the flour and salt. Add enough water to thin the batter. It should coat a spoon but be thin enough to pour and spread in the pan. Let the batter rest 1 hour so that all the bubbles have settled. The batter can be prepared a day before cooking and refrigerated. Bring it to room temperature before proceeding. Heat a 10-inch non-stick skillet on medium-high. Rub the skillet lightly with oil, butter or pork fat. Scoop up batter with a ¼-cup measuring cup, not filled to the top, and pour the batter into the pan. Tilt the pan so batter covers the surface. Let it cook until the edges of the crêpe release from the pan. Lift an edge with a spatula and, with the fingers, turn the crêpe to cook the reverse side. Each crêpe needs about 30 seconds on each side. Remove the crêpes as they are cooked and stack on a plate. They can be served immediately, dusted with cinnamon and sugar or dolloped with honey, jam or fruit puree. Or have ready one of the following fillings. 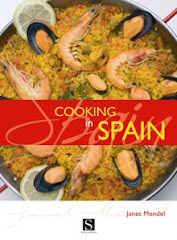 The following recipes are adapted from Cociña Galega by Álvaro Cunqueiro and Araceli Filgueira Iglesias. 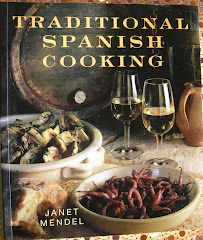 The titles are in the Galician idiom, not Castellano Spanish. 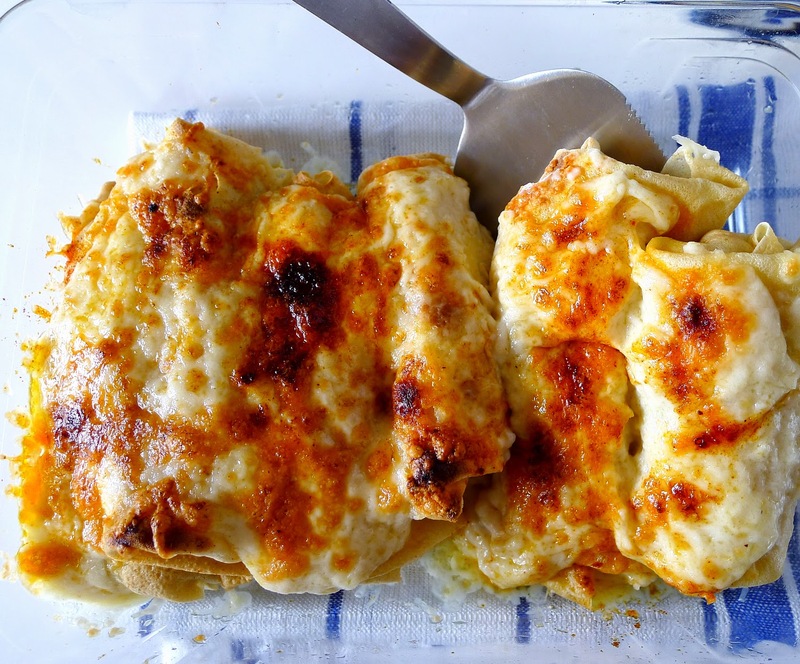 Seafood-filled crêpes with a cheese gratin topping. Use any combination of shellfish—shrimp, mussels, clams, cockles, scallops. Cook shrimp in salted water with a bay leaf. Drain, saving some of the liquid to use in the sauce for the crêpes. Peel the shrimp. Steam open the mussels, clams, cockles or scallops. Strain and keep their cooking liquid. Discard shells. Sauté the leeks in butter until softened, 5 minutes. Stir in the shellfish and wine. Cook 2 minutes. Add the chopped egg and breadcrumbs. Cook 2 minutes to thicken. Add a little of the cooking liquid to make a mixture that is creamy in texture. Add salt and pepper to taste. Place a crêpe on a work surface. Place a spoonful of the filling just below the center. 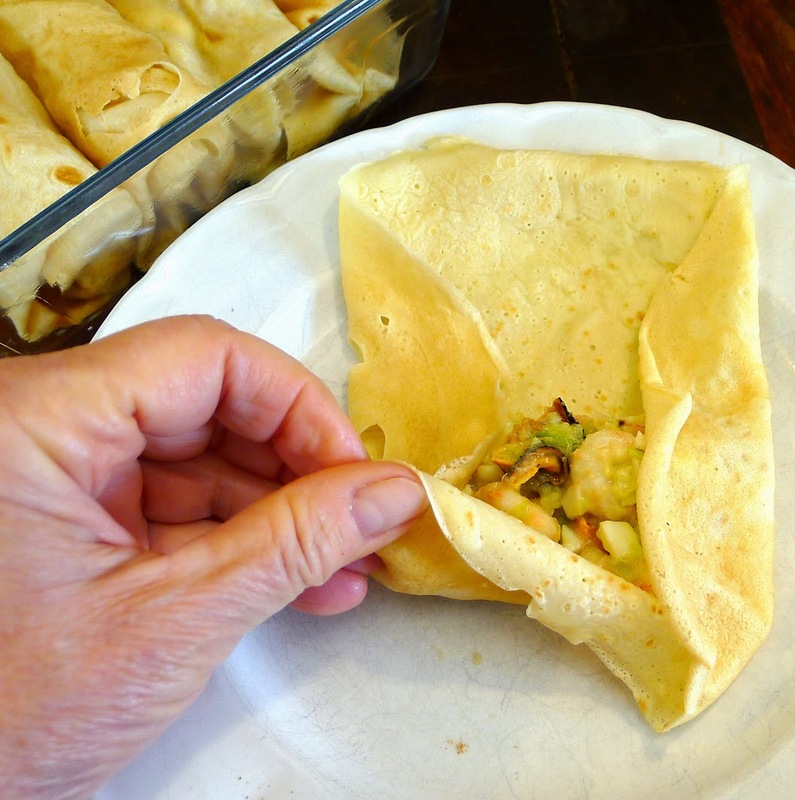 Fold in the sides of the crêpe, then fold up the bottom. Roll the crêpe to the top. Place in a buttered gratin pan. Continue filling and rolling the remaining crépes. Prepare the sauce. Heat the butter or oil in a small saucepan. Stir in the flour and cook it 2 minutes. Whisk in the cooking liquid, then the milk. Cook, whisking the sauce, until thickened. Taste for salt. Shellfish cooking liquid can be quite salty, so the sauce may not need additional salt. Preheat broiler or gratin element in the oven. Spread the sauce over filled crêpes. Top with grated cheese and sprinkle with pimentón. 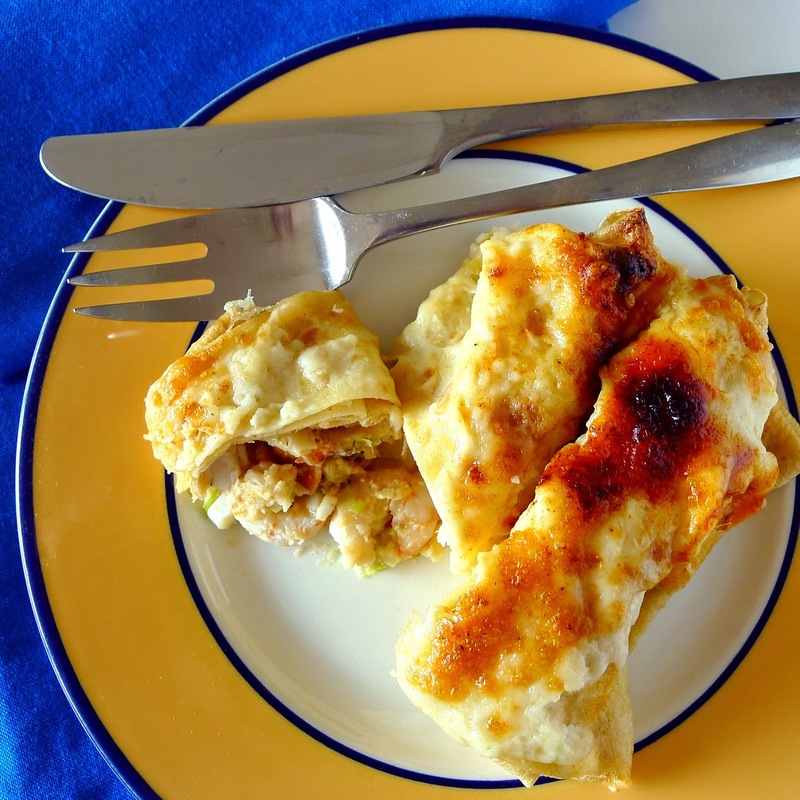 Place under broiler or gratin until crêpes begin to bubble and tops are browned, 4-5 minutes. Serve immediately. Shrimp and mussels are folded into these crêpes. With a nut filling, filloas are ready to be flambéed. Spread the hazelnuts in an oven pan and toast them in a preheated medium oven until lightly golden. Remove and when cool enough to handle, rub off the skins. Grind the hazelnuts in a food processor. Combine with the ground almonds. In a bowl cream the butter until fluffy. Set aside 2 tablespoons of the ground nuts and stir the rest into the butter with 1 tablespoon of brandy and ¼ cup of sugar. Spread filling and fold in quarters. Place a crêpe on a work surface. Spread a spoonful of the nut filling on a quarter of the crêpe. Fold over half of the crêpe, then fold again. Place the crêpes as they are filled on a heat-proof serving dish. Sprinkle the reserved ground nuts over the crêpes. Sprinkle with ½ tablespoon sugar and the cinnamon. Heat about 1/3 cup of brandy in a soup ladle. Very carefully ignite the brandy and pour the flaming brandy over the crêpes. Serve the crêpes once the flames subside. Huevos a la flamenca--flamenco eggs. The world’s favorite egg dish these days seems to be chakchouka, a North African way of cooking eggs in a spicy tomato sauce. It reminds me a lot of a Spanish dish—huevos a la flamenca—flamenco eggs, eggs baked in tomato sauce. Flamenco eggs, a Sevilla specialty, is a flouncy variation of huevos al plato—eggs on the plate with fried potatoes, chorizo and ham. Flamenco eggs used to appear on restaurant menus and at tapa bars everywhere in Andalusia. It was usually served as a starter or else a light lunch or supper dish. Never for breakfast! A dear friend of mine, Annie, a tiny slip of a woman, used to amaze the waiters at our favorite venta (rustic country restaurant). 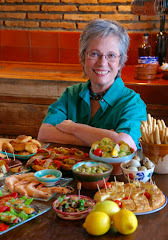 She would start her meal with a plate of fried boquerones (fresh anchovies), move on to a starter of huevos a la flamenca, then go through a whole leg of baby lamb and, usually, finish with the house-made flan! That was to last her until her next trip to Spain. I’m not sure why huevos a la flamenca have mostly disappeared from restaurant menus. Perhaps they are too ordinary, old-fashioned, in this day of chef-inspired creative cuisine. But they make a comforting, satisfying family meal. Ready for the oven--eggs on top of tomato sauce. 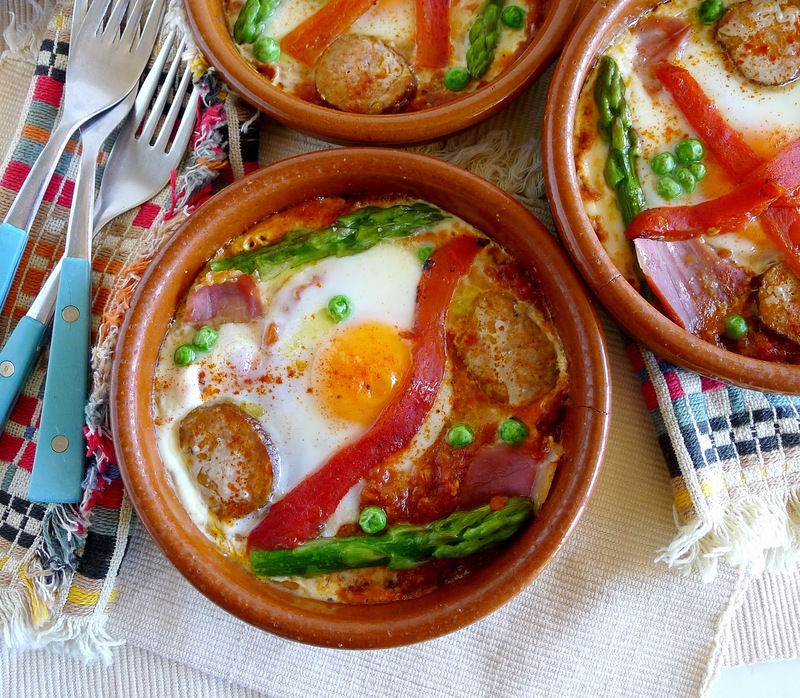 The usual preparation is one or two eggs per person, baked in individual cazuelitas, earthenware ramekins, with tomato sauce, peas, chorizo, ham and strips of roasted red pepper. Some variations call for diced fried potatoes as well, mixed with the tomato sauce. Should you prefer a vegetarian version, just omit the chorizo and ham and substitute sliced sauteed mushrooms and quartered artichoke hearts. Like a kick of chile heat? Use a little cayenne in the tomato sauce or just sprinkle hot pimentón on top of the eggs. If preferred, the eggs can all be baked in one pan, such as a heavy, oven-proof skillet. It’s even possible to cook them on top of the stove, covering the pan until whites are set. Serve the eggs with chunks of bread, fried bread or toast that’s been drizzled with good olive oil. No reason you can't serve them for Sunday brunch! You need a thick tomato sauce for the bottom of the cazuelita. Make it with fresh or canned tomatoes (recipes here or here) or use canned tomate frito or even a jar of your favorite marinera sauce. 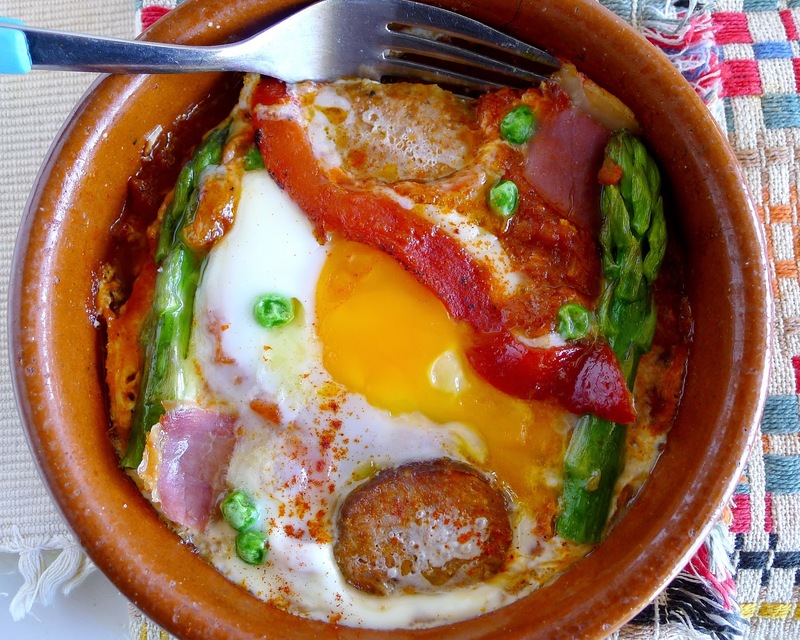 Flamenco eggs with ham, chorizo, peas, asparagus. Drizzle oil in four 6-inch cazuelas or ovenproof ramekins. Divide the tomato sauce between them. Make indentations in the sauce. Break 1 or 2 eggs into each cazuela. Put 2 halves of chorizo on either side of the eggs. Tuck slices of ham into the sauce. Sprinkle with peas. 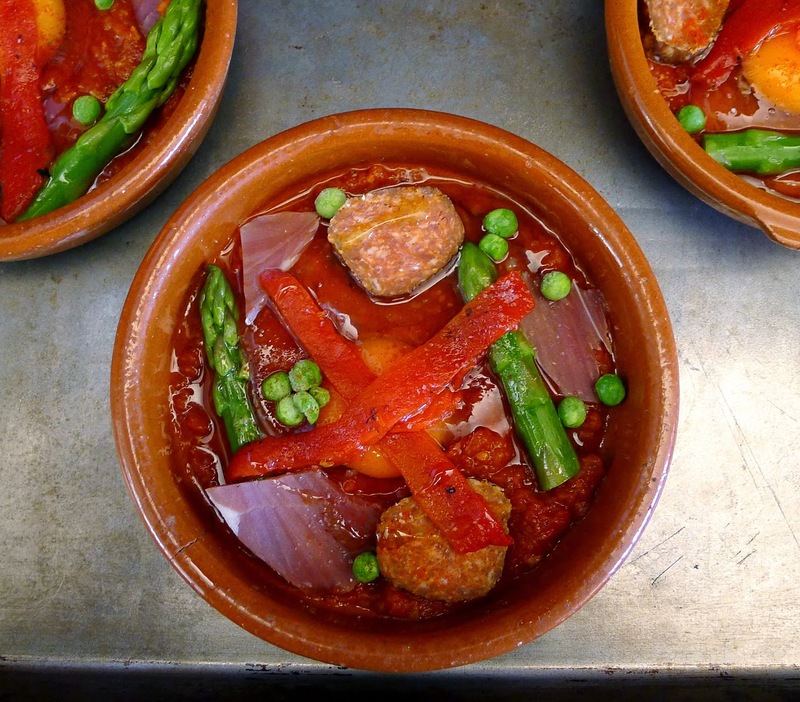 Arrange 2 asparagus tips in each cazuela. Sprinkle each with salt and pepper, a pinch of pimentón and parsley. Cross 2 strips of pimiento on top of each. Drizzle a little oil over the tops of the eggs. Bake until whites are set, but yolks still runny. This takes about 12 minutes in an earthenware cazuela. 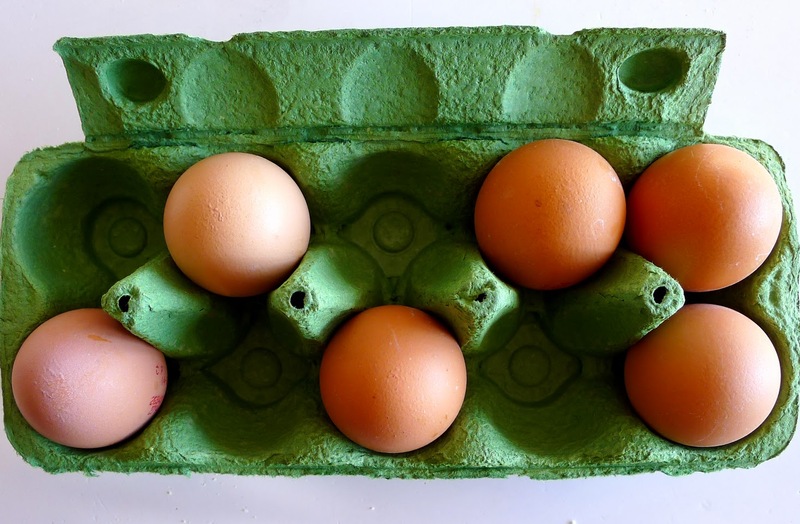 The eggs will continue to cook after removing from oven, so take them out when whites are just barely set.